Personal rescue Tool for Automobile accidents. Cuts Seal belts and breaks side windows! 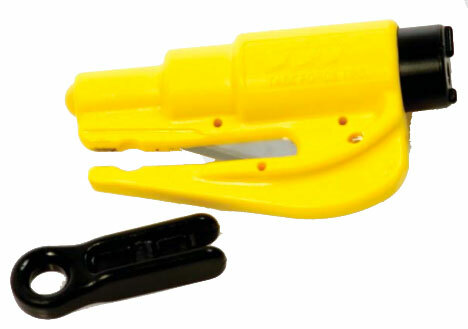 The new RES-Q-ME from Task Force Tips is a small versatile tool that can save your life! This ingenious device is intended to be placed with your car keys. It contains a spring loaded stainless steel pin that will break any tempered glass window* and a stainless steel blade for cutting seatbelts. The break apart design allows the RES-Q-ME to be quickly removed from its storage location without removing the keys from the ignition. The RES-Q-ME is easily carried on a key ring or can be attached to different placed in your vehicle. * This took will NOT break windshields or other window made LAMINATED glass. Some vehicles have laminated side windows. On these vehicles that RES-Q-ME will still function on the rear window.